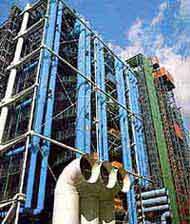 Paris attraction-guides.com - Paris, France attractions guide featuring Paris, Ile-de-France Pompidou Centre information, including location, contact details, opening hours and general Paris, Ile-de-France, France FR Pompidou Centre information. - Last updated 30/10/2012. The Pompidou Centre is one of the city's most popular tourist attractions, which displays and promotes modern and contemporary art. Works of art displayed at this magnificent building include Picasso, Matisse, Miro and Pollock.